The international airport in Bulgaria's Black Sea city of Varna will serve 19 regular routes in the summer season of 2011. The summer schedule of Varna Airport enters into force as of March 27, 2011; the first foreign tourists for the nearby Black Sea resorts are expected to arrive on Monday, March 28. The new destinations that Varna will have direct flights to Cologne, Germany; Katowice, Poland; Samara and Kazan, Russia. The destinations with the highest frequency of outbound Varna flights are Sofia, Vienna, and Budapest. As of June 2011, Varna Airport will have direct daily flights to Moscow's Domodedovo Airport. Bulgaria Air will launch direct flights to Moscow's Sheremetievo twice weekly, and to St. Petersburg – once weekly – as of May 28. Varna will also have Bulgaria Air flights to London Gatwick twice weekly. The other destinations that can be reached directly from Varna over the summer are Luxembourg, Duesseldorf, Ekaterinburg, Oslo, Kishinev, Zurich, Novosibirsk, Rostov-on-Don, Frankfurt, and Brussels. 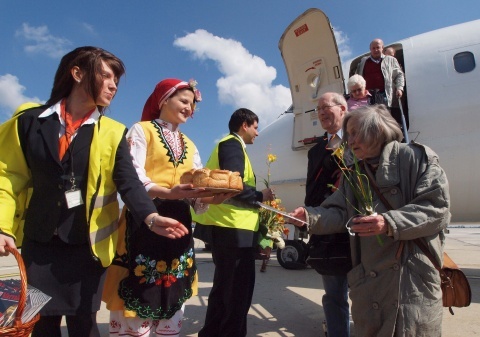 The first 164 foreign tourists for Bulgaria's 2011 summer season will arrive Monday night with a flight from Frankfurt.